Hardly reported in the news—Bill Clinton in a moment of candour. Israeli leaders have sharply criticized Bill Clinton over comments the former U.S. president made on September 22 calling Russian immigrants in Israel an obstacle to peace. Clinton, who is generally a well-loved figure in Israel for his efforts to broker a Mideast peace deal in the 1990s, also said at a round-table group this week in New York that the most recent arrivals in Israel have the hardest time agreeing to share the land with the Palestinians. Clinton knows of what he speaketh. Not only are these Russian emigres hard asses and among the most brutal IDF soldiers, most are not even Jews! The state of Israel looked the other way when Palestinian demography threatened to overtake them. The solution: bring in the Russkies.It is estimated less than one quarter were Jewish. But they got Israeli citizenship while the original displaced inhabitants, Palestinians were denied the right of return. They were brought in simply to buttress the Occupation. The teacher Mr. Jones was met the first week of school by the principal and the superintendant. It was reported that student felt “uneasy” about a poster regarding Israeli apartheid. That certainly is grounds for having a serious talk with this man posing as a teacher. What does he think erducation is.Where is the man’s head, upsetting as tudent? How did this supposed educator get a teaching certificate? Has nobody told him he must support the prevailing wisdom, the national consensus and that certainly does not include making any student uneasy. Now the student is old enough to die in many countries serving the national interest. But in Canada he must be protected from teachers like the above. And there are plenty of $100 grand men (and women) around to bring the teacher to his senses. Don’t let us catch you doing this again or we will place you under review. Only the names have been changed to protect the innocent. The 24 top money managers made $1 billion each last year! And the middle class is under water. The poor are barely hanging on. Where’s Robespierre when we need him?. (Just kidding). And the sheople are still in their seats watching Dancing with the Stars and survivor reruns. Will they ever wake up? These are the same folks who voted for Reagan and Dubya proving that it is very hard to pay serious attention in an advanced capitalist country.In France and Greece the people would be in the streets. In America they are on their couches…and yeah, the NFL season is just starting up. Now they just get angry and support tea baggers and Rob Ford, the buffoon running for mayor in Toronto. Here’s an independently wealthy guy who makes a big deal out of his low expense account.Totally bereft of ideas or vision, he appears to have caught the “I’m mad as hell” crowd” who in unCanadian-like fashion appear to be on a “throww the bums out” jag. No intelligence, just anger. And this out of Great Britain as the pope touches down on Thursday. 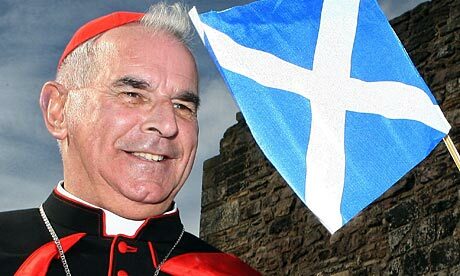 Cardinal Keith O’Brien of Scotland said liberalising Roman Catholic teachings on allowing women to join the priesthood “isn’t even considered by us” as it directly contradicted the church’s long held traditions that only men could be ordained.The good cardinal in defence of the indefensible said that he had recently celebrated the 100th anniversary of the birth of Mother Teresa, and women played senior roles in his own diocese, but women had never been amongst Christ’s apostles.Wow what an argument! Neither were blacks or midgets! As if the Holy Spirit and evolution has not opened our eyes and minds to our narrow viewpoints. Poor Keith O’Brien. Does he ever wonder why the Church no longer supports slavery? Has he not heard of the “signs of the times” and the Church’s need to be open to fresh promptings of the Spirit? And maybe, just maybe Keith O’Brien, the Spirit is speaking for feminine inclusion at every level of the church.But you will never know because obviously you feel no need to “consult the laity” as Newman suggested. No wonder people are walking away when such dumb remarks are emanating from chancery offices. “Certainly there will be some people who will object and have objected, but I’m not particularly concerned by that; everyone is entitled to their opinion,” he said. Holy smoke! He’s not concerned! Here Cardinal Newman is about to be beatified, the man who pressed for the idea of the Sensus fidelium” that the Church must heed the voice and wisdom of the baptized, that the Spirit is give to the People of God and not a rump of celibate men and he brushes all of this off with a dumb statement that all are entitled to their opinion. News flash for Cardinal O’Brien : These “opinions” are just as valid as yours. Robert Scheer has been one of the great American journalists of the past 40 years.His latest book is a primer with what is wrong with America .His subtitle is” How Reagan Republicans and Clinton Democrats Enriched Wall Street While Mugging Main Street”. He traces the catastrophic economic free fall back to Clinton and his main economic advisor Richard Rubin, a market enthusiast who helped in the deregulation mania which losened controls imposed by Glass-Steagal. Rubin of course went on to Citigroup to enrich himself as most of these Wall St and Pentagon pork barrelers do.”Greed is good” apparently was their mantra. The Clinton bubble then paved the way for the Bush pirates to complete the demolition job which has sent global economics into free fall and left ordinary folks holding the bag and shouldering the consequences of this sell out.Today 1% of the US takes home almost one quarter of America’s total income. Today there are 11 million homes underwater and of course a lack of consumer demand to revive the dormant economy.This has aslo given us the Tea Bagger phenomenon, angry people who are jusifiably hopping mad (“a campaign of lunatics”) but lack the analysis to correctly place the blame.This accounts for bubbleheads like Sarah Lalin’s popularity. Scheer points out that Obama has placed the disciples of Rubin in key positions—Summers and Geithner to name two.Three to four trillion bucks have been given to to the banks who are holding the mortgages of these homeowners.One of his suggestions—place a moratorium on these foreclosures. It is devastating for a family to lose a home. Enough anger has already been generated but the depoliticized and ignorant public will now probably vote against incumbents (read Democrats and Obama). Laying the blame here as Bill Maher once quipped is like “blaming the maid after Led Zeppelin has trashed the hotel room.” Bush Jr. should be dragged before the court of public opinion.Instaed like Blair he is pulling down megabucks on the speakers’ circuit. Lamentably the little guy pays— for not paying attention and bathing daily in the warm baths of amnesia, celebrity culture and reality shows created by advanced capitalism. And where are the voices of American bishops, those “pro-family” Republicans in all of this subversion of American families? Another shot to the groin was delivered to the reading public in Israel a week ago.After all the hasbarah (Spin) around a few bad apples in the now infamous Eden Abergil pictures widely written about, another soldier has come forth with his testament to humiliation. And of course she didn’t understand the widespread revulsion of civilized people in Israel and abroad. Her callous attitude was in contrast to te stated ideals of “the purity of arms”, that is widely bruited as Israel’s uniquely high standards of treatment of prisoners. Now meet Aluf Benn,pfc courtesy of that brave paper Ha’aretz of which pfc Benn is now editor-at-large. He writes of “a small torture that’s not in Amnesty Reports It’s a torture that depends on a single soldier, without instructions from above or the military advocate general. An outlet for the hatred of Arabs during a routine mission. And there were the humiliations. 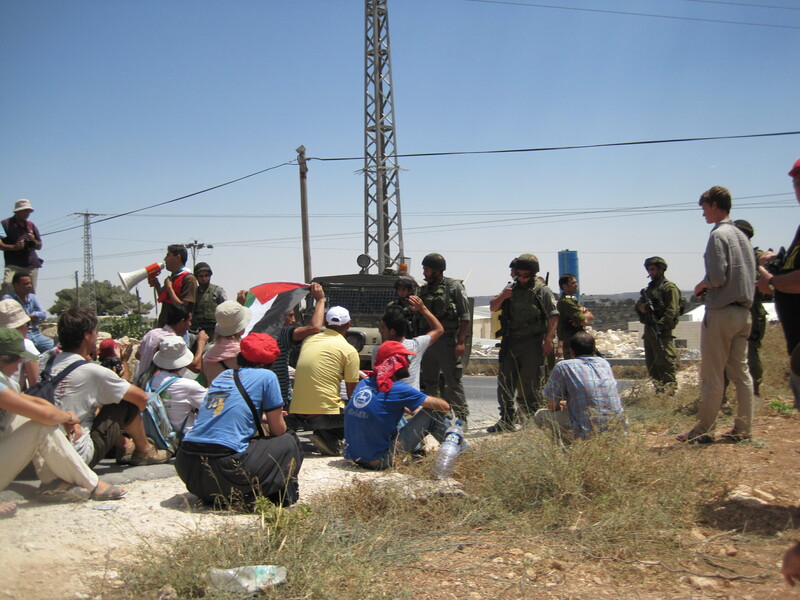 We did not force the prisoners to sing “Ana bahebak Mishmar Hagvul” (“I love you Border Police” ), as in the territories. The big hit back then was “Yaish Begin, mat Arafat” (“Long live Begin, Arafat is dead” ). In retrospect, it’s not certain that our Lebanese prisoners were opposed to Arafat’s removal; they may have even identified with that part of the song. There was nothing special in my experience or in the photographs of Eden Abergil. Tens of thousands of soldiers who served in the territories and Lebanon, like Eden and me, were exposed to similar experiences. This is the routine of occupation: pieces of cloth, cuffs, sweat in the sun, aud, um, yidak, uskut. That’s the way it has been for 43 years. When 18-year-old soldiers with weapons guard civilians with their hands and eyes bound, and see the prisoners lying in pools of urine in the interrogation basements, the situation is violent and humiliating without diverging from orders or regulations. The occupation did not “corrupt” me or any of my colleagues in the unit. We didn’t return home and run wild in the streets and abuse helpless people. Coming-of-age problems preoccupied us a lot more than our prisoners’ discomfort. Our political views were also not affected. Anyone who hated Arabs at home hated them when he was defeated and weak in the army, and those who read Uri Avnery before being drafted believed that it was necessary to leave Lebanon and the territories even when they actively took part in the occupation. But we learned one lesson: Regardless of politics, it’s better to be the guard than the prisoner. Even those who dream of a permanent settlement and a Palestinian state and want to see the settlements gone prefer to tie on the cuffs than be cuffed. It’s better to guard the prisoner and eat at the mess hall than to eat on your knees with your hands tied behind your back in a smelly room. The occupation did not transform us into law-breaking criminals, it only taught us that it’s best to be on the stronger side. You almost feel sorry for Tony Blair. Last Wednesday this sad man had to cancel a book signing in a central London store. The week before eggs were tossed in Dublin. Now protestors are threatening to show up at another signing attempt at London’s Tate Gallery on the Thames. Last week Blair tried his hollow spin on the CBC with Pastor Mansbridge. Such angst. It is obvious Blair is haunted by his monumental blunder which encouraged the likes of Bush, Cheney and Wolfowitz In the end it brought so much suffering to the Iraqi people,almost incalculable.So he’s giving the profits of his shameless mea ciulpa to a soldier’s charity. Spare no tears for Mr T. He like Clinton pulls in a minimum $200,000 per speech. If Blair wants to play the numbers game then why didn’t he also acknowledge that around 6,000 Palestinians were killed during that same period, which would equate to 60,000 Britons? During “Operation Cast Lead” Israeli soldiers killed more than 1,400 Palestinians in just 22 days compared to 3 Israeli civilians killed by rockets and 6 Israel soldiers who were killed in the assault, 3 of them by Israeli friendly fire. If Blair wants to argue in terms of quantitative death tolls wouldn’t that mean that Israel should be the country under siege and confined to the largest open prison in the world? When will this man go away? The loss of “booshah.” Purity of arms? 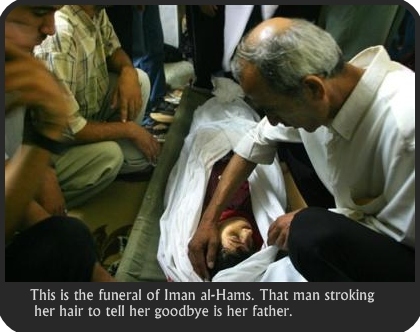 Thank goodness for the Guardian newspaper for bringing to light the latest burial not only of a 13 year old girl Iman al-Hans but the preposterous notion of “purity of arms”—the putative idea that israel’s army is the most moral in the world. Captain R fired the entire magazine of his automatic rifle into a 13-year-old Palestinian girl and then said he would have done the same even if she had been three years old.Wow how’s that for an attitude? Anyway the relieved captain was acquitted on all charges by a military court on Friday.No surprise here. Even 25 years ago this soldier would have been court martialled and the country would have been up in arms. Imagine 17 bullets pumped into a school girl who wandered within 100 yards of a military outpost.Maybe there was a bomb in her bag. Radio transcripts revealed that this youngster was “a little girl scared to daeth and heading away from the post when gunned down by this poor excuse for a soldier and a human being. This outrageous death is similar to the killing of Ahmad Husam Yousef Musa a nine 9 year old child who died by being shot in the head in 2008 by an IDF soldier as he hid behind a fig tree. The original Zionists depite the blindness of their occupying another people’s land did maintain many highly ethical attitudes.The price of Occupation ultimately saw the corrosion of ideals and as the Israelis say, a loss of “booshah.” No shame. The United Jewish Appeal placed an extraordinary full page ad in their favourite paper The National Post. It was a surefire sign that the right wing element in the Jewish community particularly in Toronto is getting very worried that worldwide the Palestinian narrative of ethnic cleansing and exclusion in modern day Israel has taken hold. That towering man of integrity and the former head of the Reform mopvement in the USA Henry Siegman summed it all up in an article written recently in Hebrew in the Israeli paper Ha’aretz. Kudos to the UJA for challenging the Jewish community to regeneration and renewal. In a consumerist environment which does indeed lead to “apathy, indifference and lack of knowledge”, young Jews as well as young Christians and Muslims need to deepen the well of compassion which is at the heart of the Abrahamic faiths. Sadly Activism U’s “training of high school and university students to stand up for Israel in the halls of academia is in danger of pure narrow ideological brainwashing. I suggest that these kids be immediately sent to Israel with the Torah under their arms to meditate on the meaning of the Exodus and the admonition in Deuteronomy 16:20 to “Tzedek, tzedek tirdof”-justice, justice shall you pursue, that you may live. The brave Rabbis for Human Rights in Israel will gladly mentor these young folks. More sad news around the boiling cauldron of Hebron—4 settlers killed by Hamas militants. Increasingly isolated by Palestinians much like the provos of the IRA were. These killers of innocent life wish to derail any attempt at peace in Israel/Palestine. There is no justification for these heinous acts.Each life is an ikon of the divine.